Before we kicked off this year’s Independence Day festivities and fireworks displays, our Boston personal injury attorneys warned residents and visitors about the dangers that come with fireworks. We also offered some simple safety tips to help to prevent related injuries. Each and every year, thousands are injured by these lights in the sky. Most of the accidents happen around the Independence Day holiday. This year’s celebration was no different as a fireworks accident in New England wound up injuring 11 people, including 5 children. According to the Boston Globe, both an 8-month-old and a 2-year-old were sent to the hospital and treated for some serious burns when some of the family’s fireworks were accidentally all set off at once during one of the areas Fourth of July residential celebrations. The explosion wound up engulfing the family’s back deck in flames. According to accident reports, it all happened when a wayward firework accidentally flew right into the main supply of the family’s fireworks causing them all to ignite. Witnesses report that the explosion rumbled the entire neighborhood and sent a ball of fire into the air. “The whole thing went off like a bomb,” said Skip Harrington, mother of the 2-year-old who was seriously burned in the accident. The child was playing near the fireworks when the accident happened. The child was reportedly covered up in flames. Luckily, mom was nearby to swoop in and help to save the child before it was too late. The young child was induced into a coma at the hospital so that doctors could work to treat his injuries. There was one firework that would up lodging itself into his arm. Medical officials say he’ll be in the hospital for at least a month because of these injuries. Also injured in the accident was the child’s 32-year-old mother. She was only recently released from the hospital, but continues to wait by her child’s side. According to a spokesman for the family, the 2-year-old is the only family member that remains in the hospital. All others were treated for their burns and have already been released. The two children who suffered “significant burns” in the accident were both airlifted to Boston to the Shriners Hospitals for Children. Investigators have yet to pinpoint the cause of the accident. All they know is that there were fireworks going off when the explosion happened. The state fire marshal, J. William Degnan, says that the explosion is still being investigated. Authorities are looking into the fireworks that were involved in the accident to see if any fall under the list of banned fireworks in the state. Officials with the local fire department say that they’ve confiscated a number of fireworks from the family’s home. 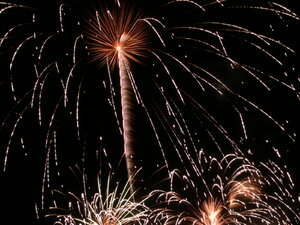 This fireworks display was an annual hosting and elaborate event that oftentimes drew in dozens of onlookers. If you or a family member has been injured or killed in an accident in Boston or in any of the nearby areas, contact personal injury lawyer Jeffrey S. Glassman to set up a free and confidential appointment to discuss your rights. Call 877-617-5333.